On 5th February 1916, in the back room of a small bar in Zurich, a group of artists launched a nightclub which changed the course of modern art. 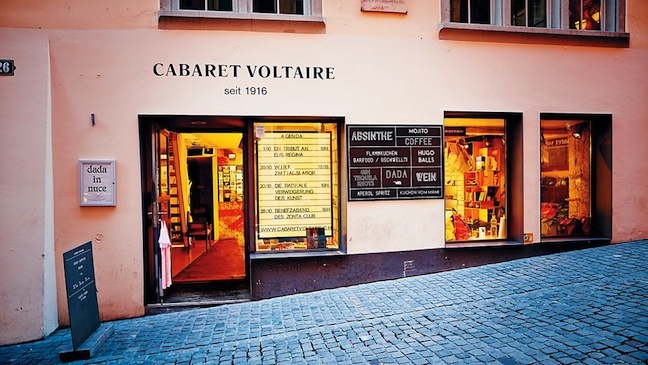 Cabaret Voltaire was the home of Dada, a movement that revolutionised European culture. A century later, this historic club is still going strong. Greta Deses’s Dada (1967) profiles the Dada movement with live performances, film excerpts, interviews and a reenactment of a performance at the groundbreaking Cabaret Voltaire. Hugo Ball, Tristan Tzara and Marcel Janco met on February 5, 1916 in Zurich with the ambitious plan of instigating nothing less than an artistic revolution. Their Cabaret Voltaire, which they founded that evening, was a combination of a pub, theater, gallery, and club. Throughout that year, they organized unpredictable events combining chaotic performances, recitations and music.